This rare earth female threaded pot magnet and a Santoprene rubber coating that protects delicate surface areas. These magnetic forms are often used to create a fixing point. Attached to magnetic surfaces, on a vehicle, metal shelving, inside mobile homes, or portable dwellings associated with mining and construction sites, utility rooms, and commercial cool rooms and in many retail environments. 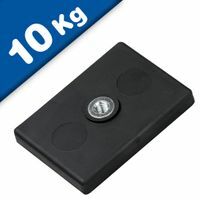 Rubber coated magnets have a superior slide resistance over regular magnets due to the increased friction generated by the rubber and steel surface. Further, rubber coating resists corrosion and protects easily scratched surfaces. These devices are often used, in conjunction with an eyelet or hook screwed into its threaded central void, for suspending outdoor equipment, heavy duty gate and door latching, hanging signage and stringing up guide lines or barriers. Water resistant for use in marine, aquatic and outdoor or agricultural environments, these small, strong holding pot female threaded magnets are used to create a secure, no drama fixing point. Magnetic engagement deletes the need to penetrate valuable surfaces and the rubber coating protects the same. Farmers, campers, long haul truck drivers, emergency workers are able, at a moment’s notice, to create a fixing point on the outside of their vehicles for stringing up hazard tape, secure signage or lighting devices. Deployed on construction sites, in cabinetmaking and electrical systems these fixing points are also housed in mechanical and agricultural situations where metal strike presents as a hazard. Shipping containers, mobile homes and office and accommodation, ablution dwellings associated with mining and constructions sites often contain magnetically abled walls, doors and ceilings. These magnetic forms create secure fixing points for the duration with a simple release for repositioning or deleting with no penalty incurred to the surfaces attached in this way. There are many applications for NdFeb Pot Magnets, mainly in applications where a strong clamping force is required. Applications include Point of Sale, window dressing, door / cupboard and gate clamps, false ceiling clamps, signs and banners, torque limited seals, jigs and fixtures, lighting holders, marketing and exhibition displays, retrieval magnets, industrial fixings, etc. 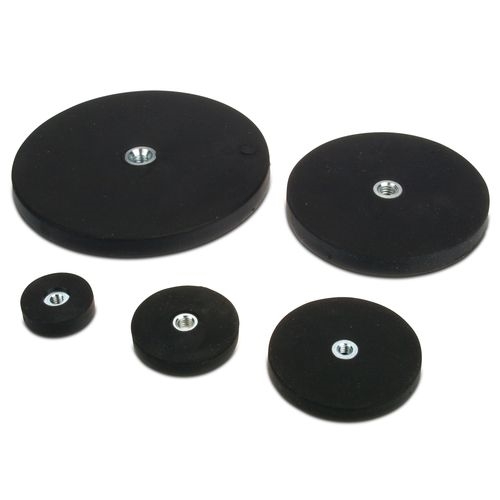 Our Rubber Coated Magnetic Systems with Internal Thread is of the highest quality and our price is most competitive. These magnetic forms are often used to create a fixing point. Attached to magnetic surfaces, on a vehicle, metal shelving, inside mobile homes, or portable dwellings associated with mining and construction sites, utility rooms, and commercial cool rooms and in many retail environments, these devices create a permanent or temporary threaded void for fixing into. On construction sites this includes fixings points for safety barriers and weather screens. Attached to metal door and window frames, these fixing points are used to fix sheets of ply or similar protecting openings in buildings under construction from thieves and inclement weather. This method, protecting the metal frame, is easy to open and close, and has the advantage of postponing the glazing scope of works until later in the building process. Inside shipping containers, portable dwellings and mobile homes and caravans, these fixing points are secure, sensitive to sensitive surfaces, and do not penetrate the wall, ceiling or floor. The rubber coating protects sensitive surfaces like glass and plastic panels. For attachment to these surfaces, a magnet is required on both sides of the panel to effect fastening. For truckers, campers and emergency services, these devices effect a secure fixing point for temporary containment lines, signs and flashing lights while protecting highly finished painted vehicle finishes via the rubber coating. Other sizes, shapes and grades may be available by special request. 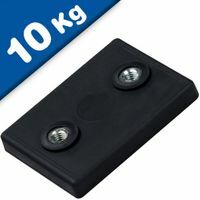 Rubber Coated magnetic systems with neodymium magnets for demanding tasks. The rubber-coated adhesive surface protects the metal from scratches and grounds for detention increases the pushing force. The neodymium magnets are arranged alternately pole and thus increase the adhesive force. As material for the rubber sheath Santoprene was used. They can be mounted with different exposures (threaded stud, threaded socket, female threaded, hole or depression). Who supplies high quality Female internal thread pot magnets with Rubber Casing? Magnosphere offers best priced Female internal thread pot magnets with Rubber Casing globally to all industries, including Automotive, Aerospace, Military, Advertising, Design House, Electronic and Academic/R&D. Please inquire for custom Neodymium magnets or magnetic assembly. 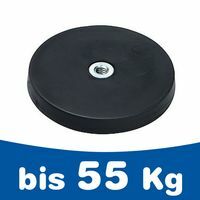 Buy Female internal thread pot magnets with Rubber Casing at Magnosphere and get a better deal!